From Ole: "I recently acquired a, what I think is a Byers with a Volvo running gear. 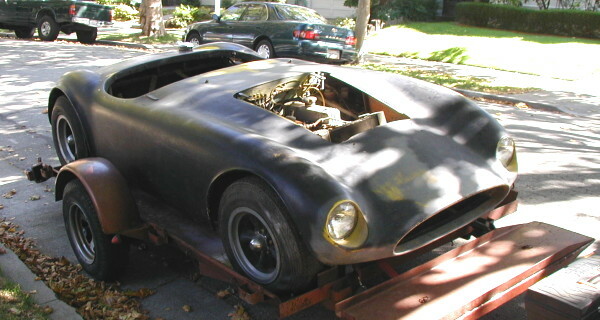 The car has been used extensively in Southern California. However, probably not raced. 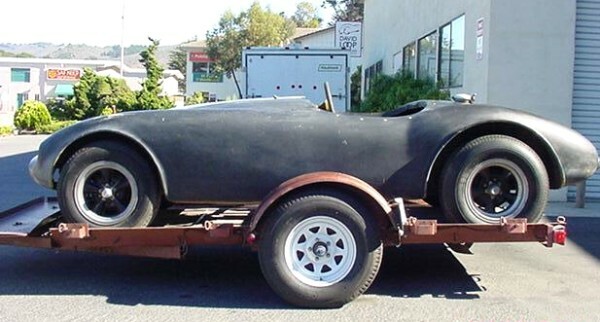 The car has a "home built" tubular frame." "When I did remove the body, which is most likely a Byers, I found on the top frame rail, behind the right rear wheel, a California DMV sticker with an identification number, indicating that the car was once licensed for the street." "The running gear is from a Volvo 444, 1957 model, but the engine and gearbox is from a Volvo year model 1958- to 61." "There is some question of what the body actually is, Devin, Byers or maybe an El Toro by Fred Baker. Since no-one can say what it is, I have entered the car at this year's Monterey Historics as a Devin. Too late to try to confuse matters by changing the name." "It’s a Devin for sure. (Don’t forget – I’m the President Of the Devin Club & Registry.)" From Ole Anderson (10/24/06): "My special turned out to be a Byers after all. But, probably made by Victress, which company bought the molds from Jim Byers and kept making those bodies under the Byers name. All measurements fit a Byers CR90 to a T. Devin bodies were made for smaller cars with shorter wheelbases (86 inches). They're "lumpier" with pods over the instrument panel and molded-in seats. The Devins have doors, as well."